One of the biggest concerns parents have about homeschooling a high schooler are the legalities – a.k.a. homeschooling state laws. The questions are many, including: What does my state require from me to home school legally? We get it. It can be scary getting it all straight, and we understand no one wants to break homeschooling laws. The FAQ we’ve included along with the quick reference table below are a great place to start. Just remember, we aren’t lawyers at Let’sHomeschoolHighSchool.com; it’s up to you to read your homeschool state laws and make sure you understand and follow them completely. F.A.Q. about state home schooling laws. Homeschooling is legal in all 50 states. 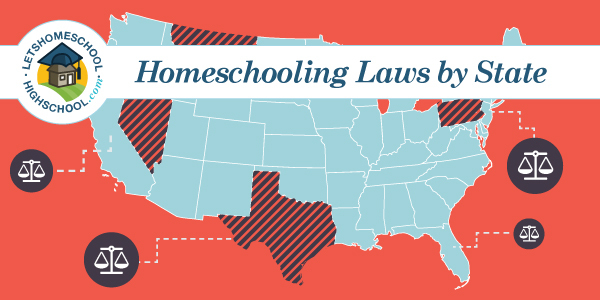 Each state has different state homeschooling laws. You must follow your state’s homeschooling regulations or face prosecution. If you are a roadschooler, you need to follow the state homeschooling laws from the state which you have your driver’s license/vehicle registrations. Take proof that you have followed those laws along with you when travelling to other states. Grandparents, parents, or family members that have been appointed by the legal guardian may homeschool the child once the legalities of homeschooling in that state have been set up. Keep a transcript or detailed record of your student’s accomplishments when they begin high school. Keeping up with this is vital for your teen’s future. Follow the suggested course guidelines for your state, and meet or exceed their requirements. *Click on the state initials in the first column to be taken to the state page listing the laws we summarized. ** Please note that this information was taken from each state’s DOE website page. We have found that some states have “laws” at the state level that are not enforced or are enforced differently at the local level. AL Ages 7-16 Depending on the option you choose there may be required subjects. Parent can home school under the private school, private tutor, or church school option. Documentation must be filed. AZ Ages 6-18 Must submit 2 documents – intent to home school and birth certificate. However, homeschooling is under the jurisdiction of each county. CA Ages 6-18, unless student graduates at 16 or 17 or passes the CA high school proficiency exam. Must be in the several branches of study required by the public schools. Parents have four options to legally homeschool. CO Ages 7-16 Testing in grades 3,5,7,9,and 11. Reading, writing, speaking, mathematics, history, civics, literature, and science Can participate in extra curricular activities and public school classes. CT Ages 5-18 Must provide evidence that the curriculum used is equivalent to that of the public school. CT State DOE has suggested guidelines for local districts. It is left to the districts to make final determinations. Possible portfolio review. DE Ages 5-16 Must teach the same subjects provided by the public school. (Only if choosing option 3) Homeschooling is considered a “non-public school” and homeschoolers must open their own. Must submit attendance and enrollment each year. FL Ages 6-16 Testing is an option for the annual evaluation. Must provide “sequentially progressive educational activities.” Must notify the state each year, portfolio, must have an annual review (several options), and can participate in extracurricular activities w/school. GA Ages 6-16 Must test in years 3,6,9, and 12. Instruction in reading, language arts, mathematics, social studies, and science. Must submit a declaration of intent (online), but umbrella schools are welcomed. Parent must have at least a high school diploma or GED. HI Ages 6-18 Must test in grades 3, 5, 8, and 10 “Satisfactory progress” Must submit an intent to homeschool or Form 4140. An annual progress report, showing satisfactory progress in all content areas, shall be submitted at the end of each school year. IL Ages 6-17 Instruction must be provided in English and include the same coursework taught in public schools in the areas of language arts; math; biological, physical and social science; fine arts and physical development; and health. Homeschool considered a “non-public” school – no real statutes regarding homeschooling. IN Age 7 until graduation Instruction equivalent to that given in the public schools. 180 days and attendance records. May participate in extracurricular activities. KS Ages 7-18 Must have a competent instructor. Education must be substantially equivalent to public school. 2 Options for homeschooling. LA Ages 6-18 None required – but may schedule it through the DOE. More Information Must apply and be approved annually. Can participate in athletics. Guidelines. ME Ages 7-17 Annual assessment with three options English and language arts, math, science, social studies, physical education, health education, library skills, computers, fine arts, and in at least one grade from grade 6-12, Maine studies. Notice of intent, initially and each subsequent year. Testing results must be submitted. 175 days. MD Ages 5-16 English, math, science, social studies, art, music, health and physical education. Request a homeschool info packet from DOE, submit forms and approval required. MA Ages 6-16 May be required by local school officials. Officials may ask about curriculum, but no requirements are set. Prior approval is a prerequisite before beginning to homeschool. MI Ages 6-18 None, but students can participate in the local school districts testing. Instruction must include mathematics, reading, English, science, and social studies in all grades; and the Constitution of the United States, the Constitution of Michigan, and the history and present form of civil government of the United States, the State of Michigan Reporting is not required, unless parent is requesting special needs assistance. MN Ages 7-17 Must test every year. Must receive instruction in reading and writing, literature and fine arts, mathematics and science, social studies including history, geography and government, and health and physical education. Must file a Full Report year 1 and letter of intent for each year following. MS Ages 6-17 Required to fill out a simple enrollment form and describe the curriculum used. MO Ages 7-17 Must offer 1,000 hours of instruction during the school year, with at least 600 hours in the basics, which will be in reading, language arts, mathematics, social studies, and science. At least 400 of the 600 hours shall occur in the home location. Parents must maintain academic records, and school year begins July 1 and ends June 30. MT Ages 7-16 Must teach a comparable curriculum to that of the public school. Must maintain records, must school a minimum number of hours, must notify the local DOE superintendent. NE Ages 6-16 Must teach language arts, mathematics, science, social studies, and health Must school a min. Number of hours, must submit a birth certificate and intent to homeschool. NV Ages 7-18 File a notice of intent to homeschool, and compose an educational plan. NH Ages 6-18 Annual evaluation (several options) DOE website states: Instruction in science, mathematics, language, government, history, health, reading, writing, spelling, the history of the constitutions of New Hampshire and the United States, and an exposure to and appreciation of art and music. Submit letter of intent to “participatory agency” (local school district). Access to public school extra curriculars. NJ Ages 6-16 Academically equivalent to that provided in the local public school. Can get a NJ state high school diploma by passing the GED. NM Ages 5-18 Notify the state each year. Keep track of attendance (180 days), must have a diploma or GED, and keep immunization records. NY Ages 6-16 Annually only for high school Instruction in:arithmetic, reading, spelling, writing, the English language, geography, United States history, science, health education, music, visual arts, and physical education Submit letter of intent, and a home school plan. Must school 180 days and send in quarterly reports. NC Ages 7-16 Annually Equivalent to public school. Must hold a high school diploma, file an intent to home school, must operate 9 months a year, keep attendance and immunization records. ND Ages 7-16 Annually – may take at local school at their cost. Equivalent to public school. Must have a high school diploma, file statement of intent with immunization records, and birth certificate. Must keep attendance (175 days). OH Ages 6-18 Annual assessment or submit a portfolio Equivalent to public school. Parents must have high school diploma, notify superintendent, and school 900 hours per year. OR Ages 6-18 At the the end of grades 3, 5, 8, and 10 Proof of progress. Notify local school district when beginning to homeschool. PA Ages 8-17 Annual written evaluation. Language arts, arithmetic, science, geography, history of the U.S., civics, safety education including fire prevention, health,physical education, music and art. Must file an “affidavit”, must have 180 days of instruction, must keep a portfolio. RI Ages 6-18 Depends on local school district. Depends on local school district. Seek approval from local district, keep attendance records, and school 180 days. SC Ages 5-17 Option 1 can take assessment with the local school. Must choose one of three options. SD Up to 18 Must test in grades 4,8,and 11 Must file exemption annually. TN Ages 6-17 Must test in grades 5, 7, and 9 (varies with option chosen) Must choose one of three options. Some require notice and /or reporting. UT Ages 6-18 Must submit a notarized affidavit of intent to homeschool. VA Ages 5-18 Annually with options Equivalent to public school. Annually submit intent to homeschool and a description of curriculum to be used. VT Ages 6-16 Annual progress assessments communication skills including reading, writing and the use of numbers; citizenship, history, and government of Vermont and the United States; physical education and health education; English, American and other literature; the natural sciences; and fine arts. Annual written enrollment sent to the Commissioner. WA Ages 8-18 Annually with options Instruction in the basic skills of occupational education, science, mathematics, language, social studies, history, health, reading, writing and spelling and the development of an appreciation of art and music. Parent must meet qualifications, must submit declaration of intent. WI Ages 6-18 a “sequentially progressive” curriculum including instruction in reading, language arts, mathematics, social studies and science and health Must submit form PI – 1206, must homeschool 875 hours a year. WV Ages 6-16 Must obtain a yearly assessment and submit it to the board. Must annually submit an intent to homeschool, with an education plan, instruction must be equal to the term of the county, parent must have a high school diploma. Must be approved before beginning. WY Ages 7-16 Can participate in the local school’s testing. Not required. a sequentially progressive curriculum of fundamental instruction in reading, writing, mathematics, civics, history, literature and science. Must submit a curriculum plan to the local board of trustees each year. I believe that in all 50 states you can begin homeschooling when you choose. I would definitely check the states' homeschooling information by calling or checking their website. Sorry about that - we've fixed the link to Illinois now! We are interested in homeschooling our daughter..We are in Illinois. The link about takes us to Idaho home school page. Is there one for Illinois. Are you allowed to begin homeschooling mid year for high school students in Vermont? Hi Barb, Getting started is pretty easy... but there are a few steps to take. Check out our beginning homeschool post! Just a few steps and you'll be headed in the right direction! when I finish time4learning do I get a high school diploma or do I get a GED. I'm in texas by the way ? My daughter and I are interested in homeschooling her for 2nd semester her senior year in Nebraska. what steps do I need to take and how do I get started? Trying to homeschool my brother , we currently live in florida . Is there anything you can give me to help guide in the direction I need to go. This is our third year homeschooling and I really need some clarification! I just need some clarification- can we use our own curriculum such as Time4Learning? Can I wirte and plan my own curriculum such as "unschooling". Does she need electives? Will she receive a High School Diploma or will she be required to get her GED? I'd be tempted to contact the HSLDA and see what they say. As a homeschooler, you should have the freedom to use whatever curriculum you deem best for your child. Hi I live in tn how can I find out what programs I can use. I enrolled in time for learning for my 3rd and 6th graders then was told by Maury county I couldn't use it . Can any one give me a cite that I can use. I am trying to find out information for home schooling my 9th grader in Wisconsin but the when i click the link above it says it cant be found. Hi Dorian, I went and fixed the link. However, I believe that you do not have to do anything to begin homeschooling in TX. They are one of the easiest states to homeschool in. I'm looking to home school my 9th grader who is struggling. We are in TX and the link posted takes me to Tennessee. New to homeschooling. I need help finding curriculum for my 11th grade son for wisconsin. None of what I have found is much help. What does the curriculum guidelines for home school look like for the state of my? Is there anything else you can help me out with? Hi Mandy, Here is a link to our curriculum guides for each subject. Hope this helps.